The Department of State has declassified a cable on the November 9, 2011 kidnapping and November 12 rescue of Washington Nationals star catcher Wilson Ramos in response to a National Security Archive Freedom of Information Act request. According to the previously “Secret/NOFORN” cable composed by the US Embassy in Caracas, Ramos’s rescue “was the result of good police work” by Venezuela’s Corps of Scientific, Penal and Criminal Investigative Corps (CICPC). 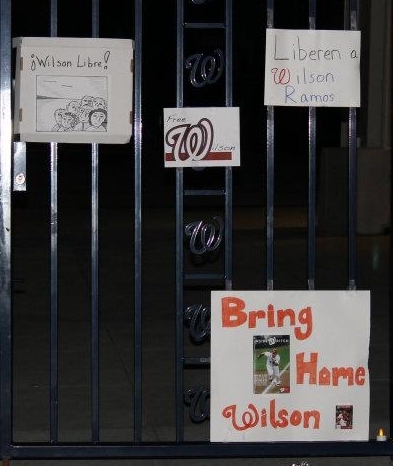 “Free Wilson” signs left at Nationals Park on November 11, 2011. Courtesy SB Nation. According to the Department of State cable, the CICPC “already had the abductors under investigation prior to Ramos’s kidnapping because the group had kidnapped other individuals in the same area of Valencia.” The State Department also reported that the CICPC used “source information and wiretaps” to immediately “identify the individuals responsible and and the location where Ramos was being held.” This information allowed CICPC to “act quickly and immediately” and begin planning its rescue mission. State reports that approximately 300 CICPC officials worked on the case. Hugo Chavez, himself, had repeatedly called the CICPC director demanding updates, and personally authorized the search and rescue mission. After 50 hours in captivity, Venezuelan commandos raided the building he was being held and exchanged gunfire with his captors for –according to Ramos– as long as fifteen minutes. Finally Ramos was rescued, and was returned at 3:0o AM to a celebrating crowd at his mother’s house in Valencia. Ramos, at CICPC headquarters in Valencia on November 12, 2011. Courtesy, Associated Press. “Thank God, I’m alive and here at home…I thank you for everything. I don’t have words to express all that I feel, and how thankful I am for all your help. Thank you, for real. I really love you,” Ramos told the crowd. According to the State Department cable, based on US Embassy contacts with Venezuelan law enforcement and media reports, “The kidnapping ring responsible for Ramos’s abduction does not appear to have been highly sophisticated. The kidnappers may have believed Ramos would be an easy target and perhaps underestimated the international media attention” his kidnapping would generate. The embassy was correct. Ramos –who hit .267 with 15 home runs in 2011– was a beloved member of the Washington Nationals, and fans throughout the Washington, DC area, United States, and world closely watched for any updates on his plight. 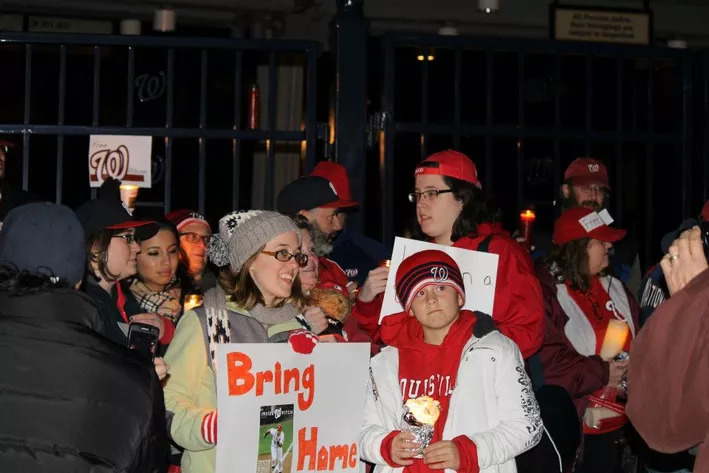 Distraught National Fans held a vigil at Nationals Park. It is likely the outpouring of Nationals and American, Venezuelan, and international baseball fans contributed to the catcher’s release. He remains a highly-productive and much loved player on the Washington Nationals. Washington Nationals fans gather for a vigil at Nationals Park on November 11, 2011. Courtesy SB Nation. But the State Department cable does not close the case on Wilson Ramos’s kidnapping. After his return, questions began to emerge about the exact nature of the crime. A February 2012 Sports Illustrated article raised the possibility that Ramos may have been kidnapped because “he chased the wrong woman.” The same article also speculated that Detroit Tigers star Miguel Cabrera secretly paid the ransom to bring Ramos home. Finally, Sports Illustrated posited that to save face, the Venezuelan authorities may have arrested six people with no actual relation to the kidnapping. 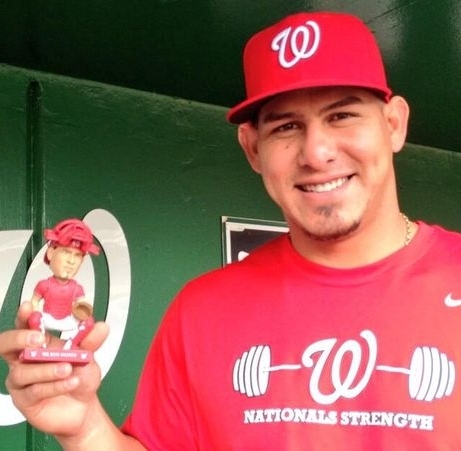 Ramos and his bobblehead, which was release by the Nationals during the 2014 season, three years after his kidnapping and release. The cable also raises more questions. 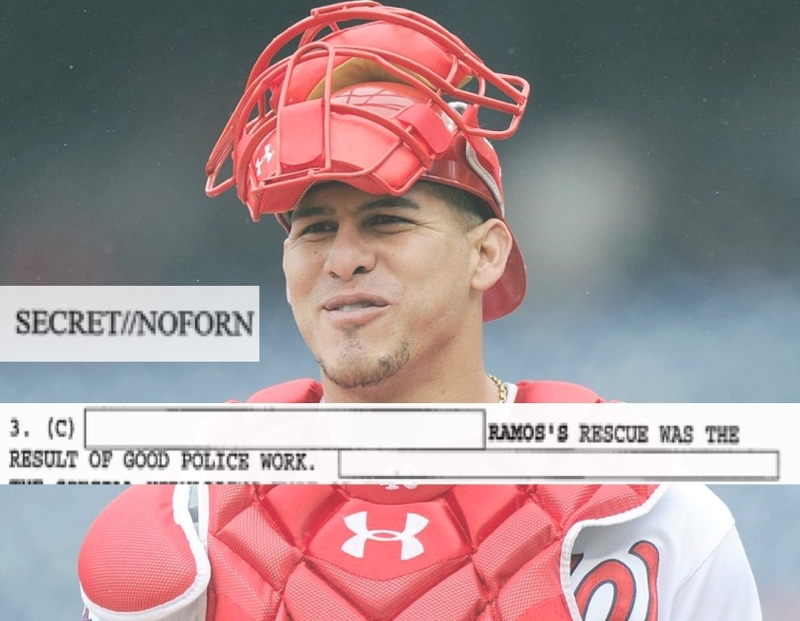 After its speculation on the FARC, a substantial section of the cable has been redacted on claimed “national security” grounds , leaving the public to wonder which aspect of the Wilson Ramos kidnapping still remains hidden. Of course, the National Security Archive has appealed this redaction.